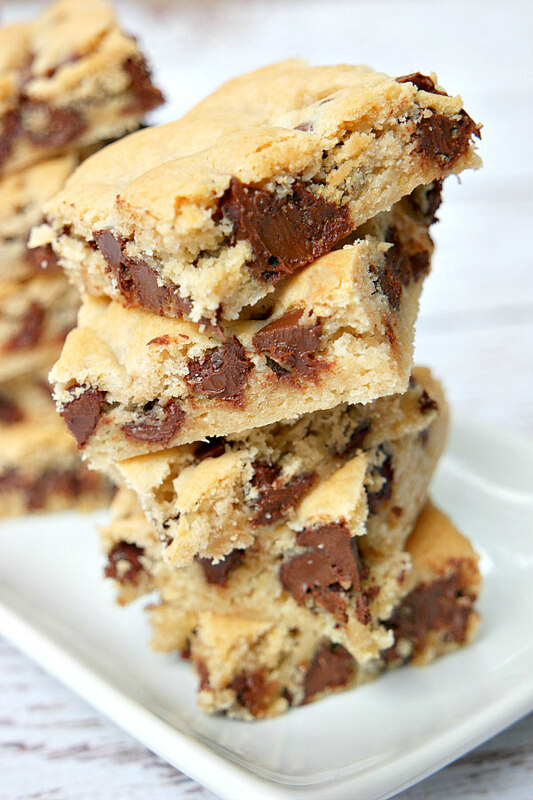 This week I made Easy Chocolate Chip Cookie Bars! Watch the video showing you how to make these easy dessert bars, then scroll to the bottom of this post and print out the recipe so you can bake them at home. I have been jam-packed with homework and sports lately, so posting has been rare. High school is tough, especially when tennis is just ending and basketball is just starting up. High school tennis went very well, and I ended up as the #2 ranked player on the team at the end of the season! Now basketball is beginning, and lacrosse begins right after that. You could say that my schedule is very packed!! But I always have time for baking, of course! 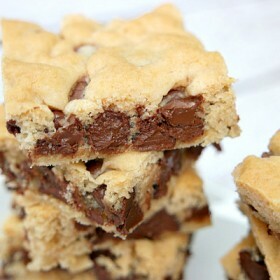 These chocolate chip cookie bars look fantastic, don’t they?! Just like a normal cookie, but a different shape and a bit thicker. These bars are so easy to make! With only four ingredients, I don’t know how you could go wrong. Surprisingly, there is vanilla cake mix in the recipe. 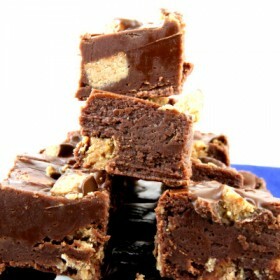 It doesn’t make the bars extra-cakey, but it does add a nice texture and flavor. This recipe is definitely a keeper. I will be trying to post more now that I am getting familiar with the larger workload and sports commitment of high school. Don’t worry, RecipeBoy is here to stay!! 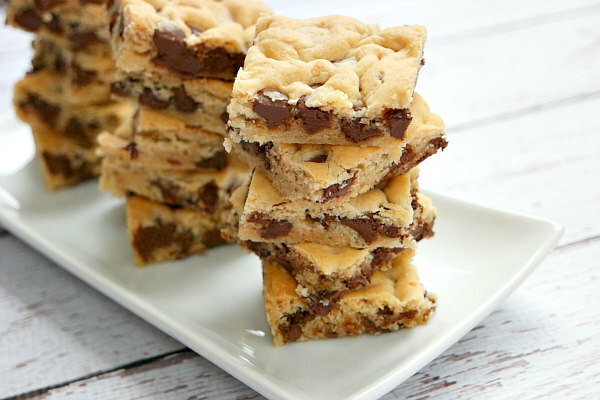 This is a combination cake and cookie bar! In a large bowl, stir all of the ingredients together until well combined. Spread the cookie dough in the pan. Use clean hands to pat the dough evenly into the pan. Bake for 20 minutes or until golden brown. Let cool, then cut into slices. Sounds good! You are turning out to be a fine cook! It runs in the family! These look totally delicious. Can’t wait to make them. Thanks so much for sharing, since you have lots of homework and play sports. 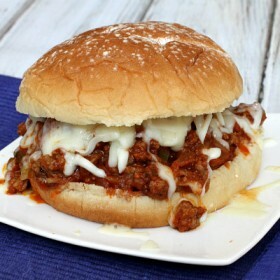 I appreciate your taking time to post an awesome recipe. Congratulations on being ranked #2 on your team – that’s a great start to your high school career! I hope you can still find time for your cooking – it’s helpful to have a fun hobby to help you relax from your busy schedule. Looking forward to trying out this easy recipe. So glad RecipeBoy is here to stay because you always have yummy stuff to share and your posts always make me smile. I totally enjoyed watching the whole Galena team play Tennis; it is an awesome sport and you fit right in. So proud of you. Anxiously waiting for what comes nest! Made these for Saturday night, but I used Chocolate Cake mix, added white & milk chocolate chips, peanut butter chips and Reese Pieces baking chips (a total of 2 cups, clean out my odds and ends items). They came out great, but then added white fluffy icing and fall sprinkles. Will make these again, they where GREAT. Never stop cooking! You’re doing awesome!! Congratulations on being ranked #2!! You give me the very best thing to cook. 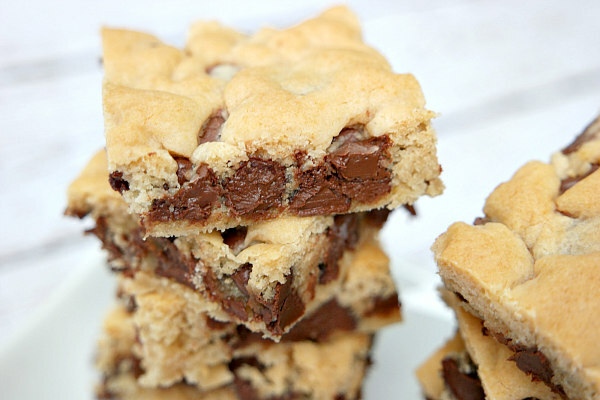 Made these tonight (actually made a half-batch)… Super-easy and so delicious! Thanks! What is vanilla cake mix? I’ve seen yellow, white, butter recipe etc but not one called vanilla? I think I used “French Vanilla,” but if you can’t find it… just use white. Oh my!! I’ve made these several times now- wonferful. This last batch I made with devils food cake mix and Andes chips- oh my soooooo yummy!! Love this recipe!